I was connected to the Correspondence newsletter that was published in Detroit, Michigan, from 1959 to 1967. I participated in all aspects of the publication from writing, editing, and drawing cartoons to traveling the country on behalf of our newsletter. Correspondence discussed the labor movement and politics, but it also featured Black artists, and some issues were devoted to the Black visual arts in Detroit as well as to publishing Black poetry. As a Correspondence staff member, I went to New York City and the struggle in Harlem; to Prince Edward County, Virginia, where the public schools had been closed; to the struggle of Blacks with guns in Monroe, North Carolina; and to the civil rights movement of Martin Luther King in Atlanta; as well as to Africa and the Caribbean. I also drew political cartoons for the newsletter. By 1963, I had become the managing editor. I wrote articles about developments in Detroit, in the auto plants and on the streets, about Drum—the Dodge Revolutionary Union Movement—and the teachers strike. Detroit was at the center of the urban upheaval of the 1960s and 1970s and Correspondence reported on it. C.L.R. James and Martin Glaberman had established the Correspondence Publishing Company in 1951 after they left the Trotskyist Socialist Workers Party. But then C.L.R. had been expelled from the United States in 1953, and I did not meet him until the mid-1960s when he went to Canada for a Black writers conference. I met him again in the 1970s when he was again permitted to enter into the United States. He was offered a position at Federal City College—now the University of the District of Columbia—in Washington, D.C. These meetings gave me some appreciation of the giant intellect and the broad historical knowledge of the man. We talked only briefly about Correspondence. Most of my knowledge of the history of Correspondence, except what I learned from C.L.R. himself, came from conversations with Glaberman, with James and Grace Lee Boggs, Philomena Daddario, and later from reading Kent Worcester’s C.L.R. James: A Political Biography. C.L.R. James, a West Indian Black who had received a classical education, took a different position on the American struggle from the Johnson-Forest Tendency in the Socialist Workers Party. James also had his own understanding of Marxism. The Johnson-Forest Tendency thought that the underclass as a whole was in the forefront of the movement, and they were looking at workers more globally. C.L.R. and the group that became Correspondence were looking more particularly at the workers in the industrial plants as being in the foreground of the movements of fights bringing revolutionary change. Therefore they believed that we should concentrate on those workers in the plant who would provide leadership of the movement. Having recognized that workers would take the lead, it seemed that there would be a worker coming out of the plant who would be the leader. Therefore it seemed natural that James Boggs, a Detroit autoworker, should be the agreed upon leader of the newly established group Correspondence. And despite his segregated high school education and his Southern upbringing, Boggs gave inspired leadership to the group and to the Black community. 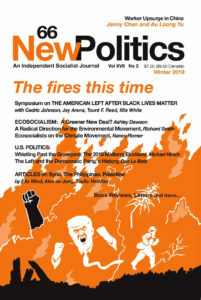 Glaberman saw a new generation of militant, leftist Blacks emerging in Detroit and at Wayne State University. That was how Conrad Mallett and I, and our wives Dolores Wilson and Gwendolyn Mallett, all militant leftist graduate students, were recruited as members and writers for Correspondence. I was working on my doctorate and Conrad was working on his, and our wives were working on their master’s degrees. We were supporting John Watson, a student who had seized control of the Wayne State University student paper and did so from a revolutionary point of view. That was one of the things that was happening on Wayne State campus. We met autoworkers that were studying at Wayne State, and because of our involvement in the radical activities on campus, we also got involved with the autoworkers movement. Some workers in the auto plants attended Correspondence meetings; in fact, the bulk of those attending our meetings were autoworkers. In our group we talked about what was happening in Detroit because Detroit seemed to be in the forefront of much of what was going on in the United States. It was really a hotbed of what seemed to be the revolutionary movement: the struggle in the school with the teachers strike and the struggle in the auto plants, for example, the Dodge Revolutionary Union Movement. There was a struggle in the plants and in the union, with DRUM, which was primarily Black, fighting on two fronts: fighting the bosses in the plant but also fighting the old union leadership for recognition. The old union leadership was white-led and came down on the Blacks struggling—it was that transition from the 1930s of the union movement to the emerging revolutionary union movement of the 1960s. The Reuther-led movement of the 1930s had been progressive in its time, but the Black workers were rising up and challenging that leadership. Jimmy Boggs was in the middle of that, which is why he seemed to be the natural leader of Correspondence. Worcester writes that Correspondence went into “decline” in the early 1960s, and after that he makes no further comments about the newsletter. This is incorrect; in fact, this was the moment of Correspondence’s rise in influence and importance as a regional paper. James Boggs was invited to speak at the Center for the Study of Democratic Institutions in Santa Barbara by its president Robert Hutchins and its vice president W.H. Ferry. Boggs began a correspondence with Thomas Merton, the Trappist monk and social activist, as well as with the famous British philosopher and pacifist Bertrand Russell. I had also begun a much-discussed exchange of views with the Rev. Albert Cleage, publisher of the Illustrated News, religious leader, and sometime political candidate. Cleage created the Shrine of the Black Madonna and several “Shriners,” as his followers were called, were in positions of power in the city administration well as on the city council. I argued that the Shrine philosophy was a version of Black capitalism and not at all revolutionary. Our exchanges received a lot of attention at the time. Contrary to the suggestion that Correspondence went into decline in the early 1960s, the paper actually flourished for a number of years, even after C.L.R. James left the organization. The Correspondence organization did break up some years later, when Conrad, Philomena, and I disagreed with Grace Lee Boggs’ perspective. She was influenced by Rev. Cleage, by his Black Madonna, and by his call for a combination of Black nationalism and revolution. His followers held positions on the city council and the school board and were influential. We felt their program was Black capitalism. Worcester writes in his biography, “It seems evident at some point in the 1950s [Grace] Lee and other members of her circle had lost faith in Marxism’s social-scientific explanatory power.” Though “they still maintained a commitment to socialist principles … their vision of humanity’s future was … centered on the state of working class consciousness.” In any case, we disagreed with their perspective and so our two groups separated. Reginald Wilson was, in the 1960s, managing editor of the leftist magazine Correspondence. Wilson received his PhD in clinical and educational psychology from Wayne State University and is a licensed psychologist in Michigan and Washington DC. He has been honored as a Distinguished Alumnus of Wayne State University and received the Anthony Wayne Award, as well as the Distinguished Service Medal of the City of Detroit. The American Association of Higher Education also has bestowed the Harold Delaney Exemplary Leadership Award upon him. He now lives in Washington DC and is a member of the editorial board of New Politics.